Lara Pacheco & Blendily founder Ivy Chuang first met through Laurie Lava-Brooks, proprietress of Clary Sage Herbarium. When Blendily first began its journey in 2014, Ivy would frequent Clary Sage Herbarium to procure some of her ingredients and find inspiration for her new creations. 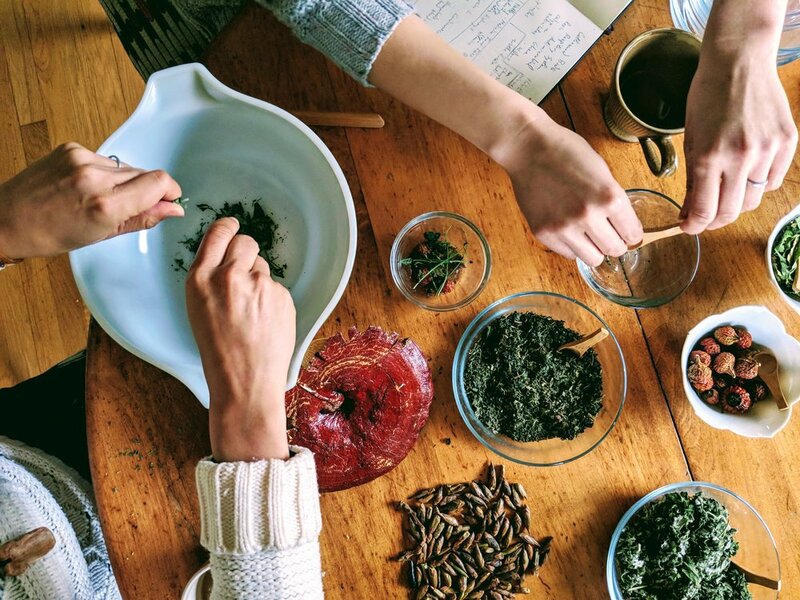 At the same time, Lara Pacheco had just finished the 3-year program at the School of Traditional Western Herbalism and was embarking on her endeavors at Seed & Thistle Apothecary. Laurie made an introduction of the pair and over time, a synergistic relationship developed between Blendily & Seed & Thistle. Lara & Ivy met regularly in the years since to discuss a variety of topics including herbal medicine, garden planning, seasonal foraging, cultivation of communities, racial & social justice, and their shared experience as mothers. In the harrows of modern society, somehow the knowledge of caring for oneself directly from the Earth had been lost. With globalization, and an on-demand consumer culture, people have lost connection to the Seasons and to the flora & fauna in their surroundings. Lara & Ivy were both interested in the ancestral knowledge of plants, and empowering others to regain access to this wisdom. Blendily Boxes was developed in partnership with Seed & Thistle providing guidance on herbal teas & tinctures that would be supportive for seasonal transitions and self-care rituals. Each box is carefully curated with an array of products that will encourage self-care & self-love throughout the year. Orders for this box ended on April 15. They will be delivered between April 1 - April 30. Stay tuned for announcements regarding the next box!